Leylines appear to be carriers of energy – but not always. The energy appears to be beneficent – but not always. Leylines appear to coincide with ancient trackways – but not always. Leylines appear to lie above the ground – but not always. Leylines often coincide with underground water (as dowsed) – but not always. 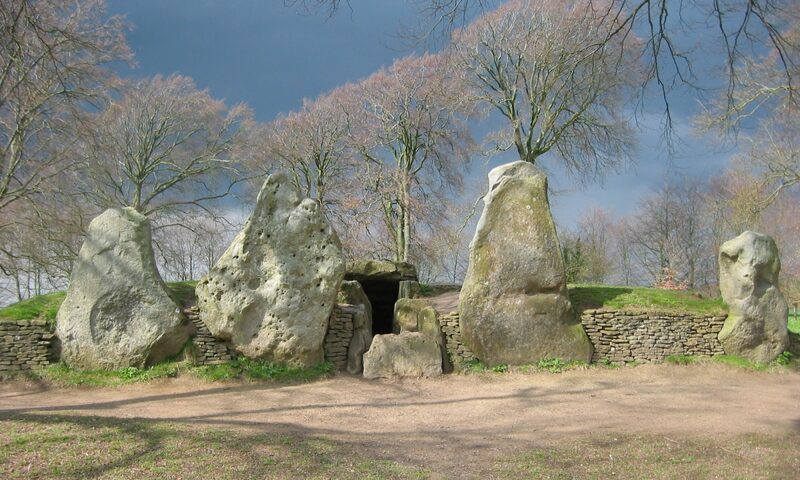 Leylines connect ancient megalithic sites – but not always. Leylines are absolutely straight – but not always. Leylines can be sensed as currently active – but not always. Leylines are undivided – but not always. Leylines are shortish, about a days walk in length – but not always; sometimes much shorter and very occasionally much longer. Leylines are over land – but notable exceptions, particularly in Cornwall and Scotland. The SOURCE of Ley line energy is purely natural; is also spiritually, mentally and emotionally NEUTRAL. It can, however, easily absorb “colour” at any of these levels, from human intervention. The straight-line direction of ley lines is due to knowing intervention on the part of the megalithic builders, who also determined more than one colour for their channels of energy. The “colouration” was mostly – but not always – in the band that we might describe as lunar/ goddess/ fertility/ blessing. The sources of energy seem to be tied in particularly with the patterns of underground water known as “blind springs”. The nature of the energy is not really determined, but it appears to behave in many ways that are closely analogous to electrical energy, but it is not electric. It may have side effects in the band that we know as electric. It has also, occasionally, been detected to have effects in the region of energy that we describe as ultrasound, in the presence of some standing stones. I would tend to regard this energy as non-physical, as we currently define physical, but lying very close indeed to the physical. For the reason that leys sometimes appear to be ancient trackways and sometimes like electric power conduits, it is perhaps easy to hazard a likely explanation. The pre-Druidic religion, which is what we are discussing, seems to have been super-shamanic; that is to say the ritual technique was essentially shamanic, but the infrastructure was highly technical and co-operative. Clearly the religious leaders had the power and authority to command prodigious use of man-power. A use of man-power which must furthermore have covered many tribes at the same time. The moving of Welsh bluestone to Stonehenge is an obvious case in point. Alexander Thom’s work has demonstrated clearly the high degree of expertise in astronomy, astrology, surveying and construction that those folk could call upon. “Religious” sites tended to be in spots that combined a source of “power” with good astronomical viewing, especially along the line of the ecliptic. Such points would tend to be above fertile areas of early farms and would provide navigation marks for folk needing to travel between one tribal area and another. Which came first, tracks or power lines, is not clear; but it is not surprising that in many cases they should follow the same paths. More recently Paul Devereux has advanced “evidence” that leylines are almost purely shamanic spirit lines; a necessary adjunct to shamanic trance practices. It is certainly true that if we define leylines in terms of “alignments”, then a proportion of such alignments would range from daft to impossible as choices for any sort of trackway, unless one was equipped with a hang-glider and coracle. Interesting though the idea of spirit lines may be, no single catch-all explanation will suffice. From the evidence of dowsing it is clear that “Lines“ are not all of one sort. This seems to be the case, even allowing for some dowsing reports being “ coloured “ by the dowser’s preconceptions. My own experience, setting aside unchecked map dowsing, is confined to one or two areas in Yorkshire and one area in Arizona. For what it is worth, some of these “ lines “ appeared to be independent of any of the signs that would get them classified as leylines. Others were on possible alignments. Two lines (one in America and one in Yorkshire), showed me the straight-line direction to possible unrecorded sacred sites. It is interesting to speculate whether this kind of directional sense has any role to play in the formation of trackways and/or leys. There is no shortage of theories to account for the existence and possible purposes of leylines. On the face of it, the available explanations are self-contradictory and hence quite unsatisfactory to the sceptical enquirer. In the western world we seem to breathe in reductionist attitudes with the air; and as a result we crave simple “ nothing-but “ explanations. It seems to me that there are a number of questions that dowsers might address. Such questions could be divided into two groups; one group would require site and survey techniques to get answers. The other group of questions would be of a more speculative and theoretical nature; and these would possibly need the use of the pendulum as a tool for speculative enquiry. What examples are known of definite energy effects on a formal ley (alignment of 4 or 5 sites). Are there known examples of beneficent or harmful effects on any such alignments. Are there examples of lines which dowse similarly to a leyline, but which are not apparently on any formal alignment, (but possibly on a Solar/Lunar/Stellar alignment). Is there a dowsable difference between alignments which include/start with/stop with a standing stone or stone circle and other alignments not involving any such stones. Are there examples of leys (or other energy lines) that change their dowsable characteristics from time to time and is there any Solar/Lunar/ weather link? What evidence exists that ley energy can be interrupted or corrupted by modern activities; such as power lines and motorways. Also can such a Ley be re-established. Considering all lines that may have a harmful effect; is there a single method for nullifying those effects, or are both effects and cures varied? Leaving some pages of questions unasked, I now turn to more speculative matters. These questions are such that verifying the answers would be very difficult or impossible. The best that one could aim for would be a majority vote on Yes/No answers and, at some later date, archeological evidence in general support. When did the ley network originate? Is the ley network linked to the development of agriculture? Did the early shamans use leys as spirit paths? Was this their only use? Were leys used as a means of communication? Can a ley network be re-established? Given our modern mind-set, can we create energy lines? These questions are only intended to give a idea of the sorts of things I have in mind and which currently interest me.